It is the end of October and the doorway to the dark half of the year swings open. Samhain the season of frost and firelight is upon us as we light our candles for our beloved ancestors. On this night we pray for all those who no longer walk in this world and breathe a special blessing for those we have lost this year. Celebrate … Laugh … Sing … Dance … Make Merry … and Stay Safe. 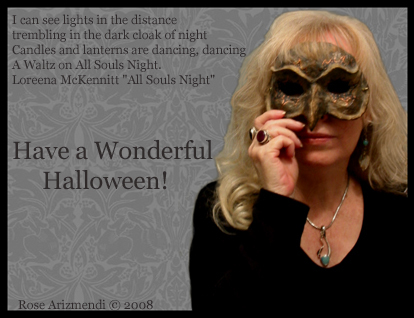 Halloween – Digital Collage … 3 X 4 inches. 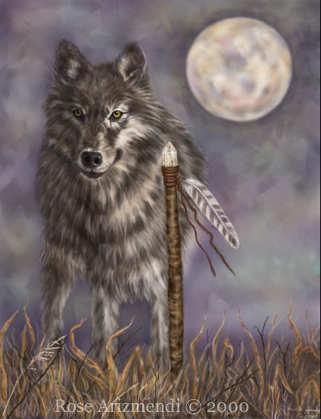 I have always had an affinity for wolves, love painting them and as a child I had reoccurring dreams of wolves. My dreams were never scary or threatening. 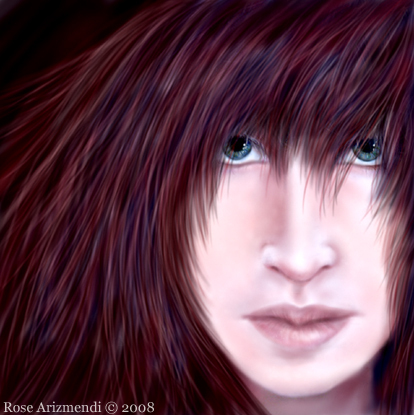 Below is a painting I did several years ago. Kyanite is one of my favorite stones! It is excellent for aligning all of the energy centers and is especially good for the 5th and 6th chakras. 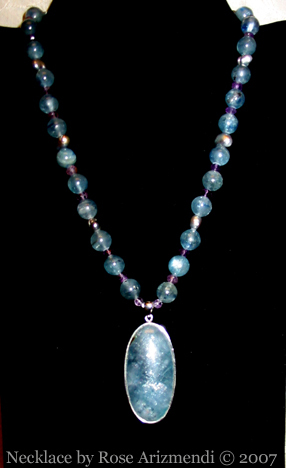 It is a very powerful stone which allows access to the Universal Energy that enhances your body’s abilities to heal. When using Kyanite during a Chakra Balancing Session you may want to place this stone between the heart and navel chakras. It may also be used between the heart and third eye for encouraging self expression. One of the wonderful things about Kyanite is it does not accumulate or retain negative energies, therefore you never have to clean or clear it. It is a great stone for artists, actors, writers, dancers and for anyone who wants a little help with their creative endeavors, and is also known as the “Serenity Stone” which enhances ones sense of inner peace and tranquility. When I woke up this morning the sky was dark and heavy with fog as I slowly made my way to the kitchen to heat some water for my morning cup of tea. These days I find myself turning in towards myself, towards contemplation, meditation in preparation for the cooler days ahead. The wheel turns! A new moon in Scorpio should make life a little more interesting for all of us…today. 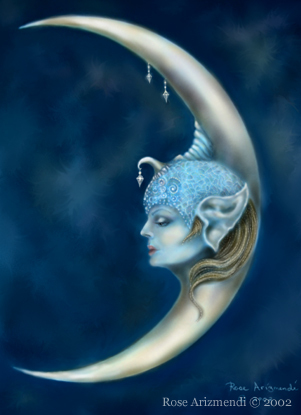 The new moon is the time for planting the seeds of our intentions and dreams. What destructive behavior patterns would you like to let go of? The new moon in Scorpio gives us the strength to make necessary changes in a positive life-supporting way. This time of the year is filled with all things Halloween and it’s almost time for all the little witches, ghosts and goblins to roam the streets in search of goodies. Are you ready? Today I was watching the golden autumnal light catching the trees on fire and found myself thinking about how mystery and magic seems to be everywhere and sometimes where it’s least expected. I found a big beautiful black cat in my garden while I was picking two ripe pomegranates from our tree. There he was, larger than life peering down at me from his perch high above, so I turned to place my fruit on a table near by and when I turned back around he was nowhere to be found. Spooky! I quickly left the garden and returned to the house, and when I opened the back door I was greeted by the smell of homemade bread baking in the oven.Yum!